In 1942, a rumor spread around England that Hitler was planning to initiate an airdrop of weapons into the prison camps to bring back Nazi prisoners of war (POWs). Hearing the rumors, England became worried and asked America to house their prisoners. America reluctantly agreed and the Germans, Japanese and Koreans POWs were sent to work in America on empty supply ships known as Liberty Ships. POWs were first sent to work in military camps, but then the Army realized that prisoners could pay for their keep if they worked in rural areas that lacked manpower. Japanese and Koreans were put in permanent base camps, while the Germans were put in branch camps, camps that were only used if needed and tended to be more lenient. The security varied with the type of camp, some letting prisoners interact with civilians while others kept them segregated. Wisconsin needed POWs to work in the fields and harvest food since American men were off fighting and the women worked in factories. They worked in pea, cucumber, and corn fields. POWs are the ones who most likely saved the crops during the war. Other POWs were hired by companies. The government made money from the POWs’ labor. The companies paid the military 55 cents per hour per prisoner, and the military paid the POWs 80 cents per day. Sometimes they were even allowed to use the money to buy candy or tobacco. Even though the POWs were in towns in which civilians lived, many people still don’t know that there were POWs in Wisconsin, and it was supposed to stay that way. Due to the anti-German sentiment that existed after WWI, the Army thought it would be best to keep the POWs a secret. However, their assumption was wrong. At that time, one-third of Wisconsin citizens had German ancestry. They felt a connection with the Germans because of their heritage. Some knew how to speak German and others even found family members among the prisoners. In one case, there was a man who went to Germany to see family, was drafted into the German army, and became a POW. His sister frequently drove from Chicago to visit him. When the Army realized what was happening, they outlawed civilians interacting with the POWs. However that didn’t stop citizens from giving workers food, clothes, and blankets. Barely any German POWs tried to escape since their stay was mainly comfortable, unlike the camps where the Japanese and Koreans POWs were kept. 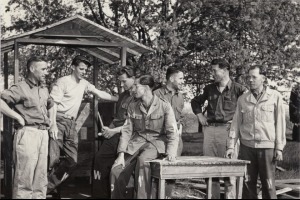 A year after the war ended, the POWs were required to leave the country. Even when they left, many immigrated later to Wisconsin because their homes had been destroyed or they were unable to find family. Those who stayed in Germany kept in touch with people in Wisconsin. Whether the friendships lasted or not, we can all be sure that the Germans had a long-lasting effect on Wisconsin’s cultural and economic well-being.